bir rol oynadığını açığa çıkarmıştır. pre-service middle school mathematics teachers’ pedagogical approaches. Keywords: Problem solving, ways of thinking, ways of understanding, pre-service mathematics teachers. Cuoco, A., Goldenberg, E. P. and Mark, J. (1996). Habits of mind: An organizing principle for mathematics curricula. The Journal of Mathematical Behavior, 15(4), 375-402. English, L. D., Lesh, R. and Fennewald, T. (2008). Future directions and perspectives for problem-solving research and curriculum development. In M. Santillan (Ed. ), Proceedings of the 11th ICME (pp. 6-13), Monterrey, Mexico. Fraenkel, J. R. and Wallen, N. E. (1996). How to design and evaluate research in education (3th Edition). New York: McGraw-Hill. Harel, G. (2008). DNR perspective on mathematics curriculum and instruction, Part I: focus on proving. ZDM, 40(3), 487-500. Harel, G. and Lim, K. H. (2004). Mathematics teachers’ knowledge base: Preliminary results. In M.J. Hoines & A.B. Fuglestad (Eds. ), Proceedings of the 28th Conference of the ICME (Vol. 3(3), pp. 25 - 32). Bergen, Norway. Harel, G. and Sowder, L. (1998). Students' proof schemes: Results from exploratory studies. In A. H. Schoenfeld, J. Kaput, & E. Dubinsky (Eds. ), Research in collegiate mathematics education III (pp. 234-283). Province, RI: American Mathematical Society. Koichu, B. and Harel, G. (2007). Triadic interaction in clinical task-based interviews with mathematics teachers. Educational Studies in Mathematics, 65, 349-365. Lesh, R. and Harel, G. (2003). Problem solving, modeling, and local conceptual development. Mathematical Thinking and Learning, 5(2-3), 157-189. Lim, K. H. (2006). Students’ mental acts of anticipating in solving problems involving alge-braic inequalities and equations. Unpublished dissertation, San Diego State University. Lim, K. H., Morera, O. and Tchoshanov, M. (2009). Assessing problem-solving dispositions: Likelihood-to-act survey. In S. L. Swars, D. W. Stinson and S. Lemons-Smith (Eds. ), Pro-ceedings of the 31th of the PME-NA (pp. 700-708). Atlanta: Georgia State University. Lim, K. H. and Selden, A. (2009). Mathematical habits of mind. In S. L. Swars, D. W. Stin-son and S. Lemons-Smith (Eds. ), Proceedings of the 31th of the PME-NA (pp. 1576-1583). Atlanta: Georgia State University. Pólya, G. (1945). How to solve it. Princeton. New Jersey: Princeton University. Ramnarain, U. (2014). Empowering educationally disadvantaged mathematics students through a strategies-based problem solving approach. The Australian Educational Research-er, 41(1), 43-57. Schoenfeld, A. H. (1992). Learning to think mathematically: Problem-solving, metacognition and sense making in mathematics. In D. Grouws (Ed. ), Handbook of research on mathemat-ics teaching and learning: A Project of the NCTM (pp. 334–370). New York: Macmillan. Strauss, A. L. and Corbin, J. M. (1998). Basics of qualitative research: Techniques and pro-cedures for developing grounded theory (2nd ed.). Thousand Oaks: Sage Publications. Viholainen, A. (2011). Critical features of formal and informal reasoning in the case of the concept of derivative. In B. Ubuz (Ed. ), Proceedings of 35th PME (pp. 305-312). Ankara, Turkey. Watson, A., and Harel, G. (2013). The role of teachers’ knowledge of functions in their teach-ing: A conceptual approach with illustrations from two cases. Canadian Journal of Science, Mathematics and Technology Education, 13(2), 154-168. ISNAD KABAEL, Tangül , AKIN, Ayça , KIZILTOPRAK, Fatma , TOPRAK, Onur . "Ortaokul Matematik Öğretmeni Adaylarının Problem Çözme Sürecindeki Düşünme Yolları, Anlama Yolları ve Pedagojik Yaklaşımları". 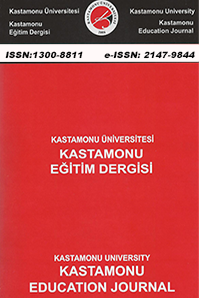 Kastamonu Eğitim Dergisi 25 / 2 (March 2017): 849-868.